For AKB48 fans, almost everybody knows who’s in the top 16, regardless of who your favorite is. 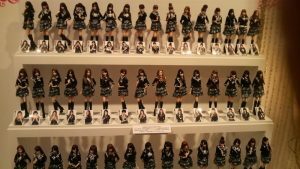 However, to non-fans, how popular are the most highly ranked AKB members? A survey conducted by Sirabee compares members rankings and how well known they are to the general public. The survey was conducted on a site called Mind Sonar, and had a sample size of 416 people, peoples ages from their teens to their 50s, including both men and women. The survey was conducted between June 17,2015 and June 20,2015. It seems they asked the question, “Do you know this person?”. The results are here! All graphs provided courtesy of sirabee.com. This first graph focuses two member slated as “aces” for the next generation: Miyawaki Sakura, who first broke into the Kami 7 this year, and Shimazaki Haruka. Even from here, it seems that rank doesn’t correlate to being well-known. It’s no doubt that the top three would have some of the absolute highest ratings. 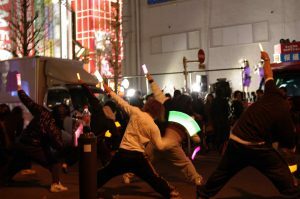 Beyond their usual idol activities, Sashihara, Kashiwagi and Mayu appear in plenty of dramas, music, and TV shows. And about members who did not even run for the election? 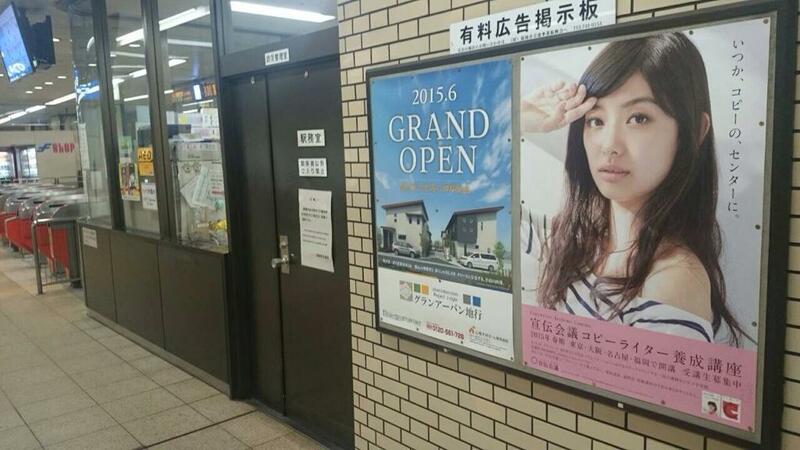 Here we see Kojima Haruna and Matsui Rena respectively. With regards to Kojima Haruna, this doesn’t seem too surprising, as she currently is currently amongst the top 10 most followed Twitter users in Japan. It gets much more interesting when you compare the the popularity of the most recent unranked members. 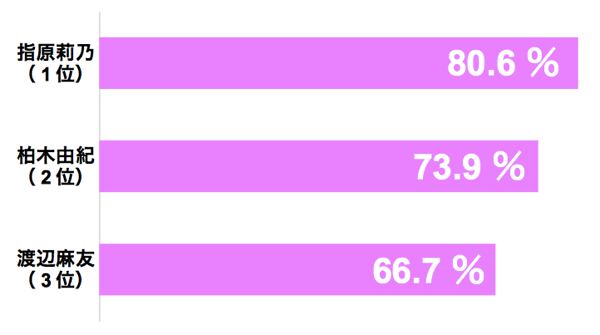 It appears even unranked members Shimada Haruka (22.5%) and Oya Shizuka (27.0%) are even more well known than even the lower placed senbatsu members! 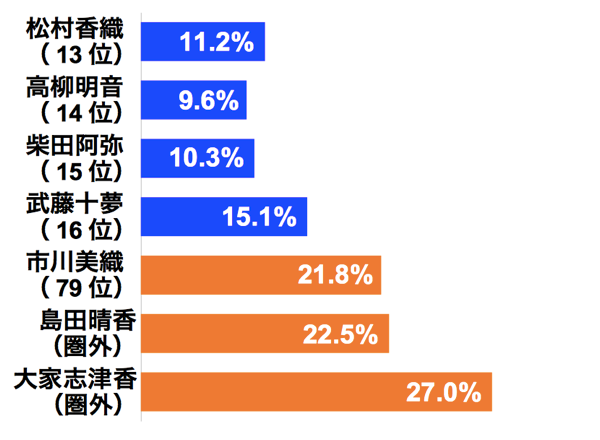 As you see, Matsumura Kaori comes in at 11.2%, while Takayanagi Akane and Shibata Aya get 9.6% and 10.3% respectively. 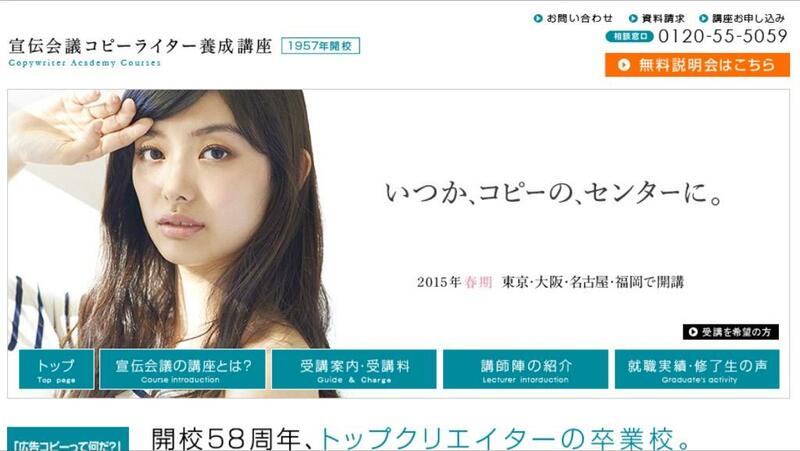 Previous PostAKB48 stars in new CMs for Papico ice creamNext PostCutest girl in all of 48 groups: Nagao Mariya! Im gonna guess the numbers under the name is the ranking this year.With that said Aya shibata is such an anomaly to me.She doesn’t seem to be pushed as a top member in SKE shows and as far as i know doesn’t have any specialty like Matsumura’s blogs or Suda Akari’s flexibility/Godly Handshake.But ranked pretty high 2 sousenkyo in a row. As a foreigner who only knows the girl from subbed show/random internet videos,i feel like im missing a huge chunk of information(maybe they’re popular in entertainment business not shown outside Japan) as to how the girls like Shibata and Muto Tomu gets so high in ranking. 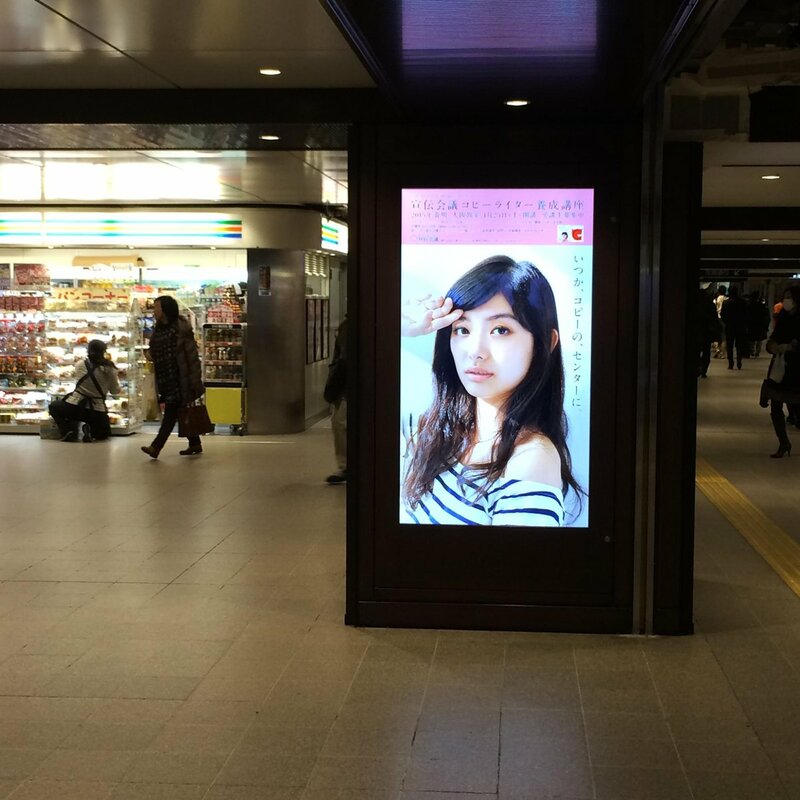 Well, Muto was featured as the image girl of an academic campaing all over Japan (not a biased opinion); her image was literaly in every station and it wasn’t an AKB related campaign, but focused to college students. Probably she might not be known by name at all, but her face might be in the public’s subconscious. Ahh… I knew there was something more to it.Thanks for enlightening me haha.I guess even with non-AKB job they can still get exposure and in the end it will(and it did) have such an impact to rankings. Apparently those courses are well known, so I think that people at least find the face familiar. She’s no longer the image girl though, but the exposure was decent for someone who doesn’t really have much push from management/has no agency. Oh wow,yeah that’ll do something to popularity.Not to mention she’s already gorgeous to begin with. wow, she’s so beautiful! I wish I can see her face everywhere, lol.